As if it's Monday already!! Weekends always seem so fly by so fast, I'm relieved to have Tuesdays off now as it breaks my work week up so nicely!! Dinner at my fave restaurant, Pedal and Tap, for a Friday night date night with Cody. YUMMMM. Check out what I wrote about P&T on my Kootenay Love & Local Reviews page. A beautiful, but windy, Saturday morning neighborhood walk; and a nicer, warmer one on Sunday. Watching my cousin's hockey game and getting to visit with my Aunt and other cousin while we watched. My uncle was coaching which was also pretty fun to witness! Late lunch at The Heid Out Restaurant and Brewhouse with my wonderful mom and dad, & Cody too! Grocery shopping. I LOVE having a freshly stocked fridge and pantry. So. Many. Options. It seemed like everything on my list was on sale, how great is that!? I purchased my first bottle of essential oils (Lemon) that I plan to start using in home made cleaning and bath products. Completing my list of how I want to live in 2014, check it out here. I went through my closet and pulled out all of the clothes that don't fit properly at the moment. I piled them all in a clear bin and labelled it "Goal Clothing". As the clothing starts to fit again I can add items back into my closet. I prefer to judge where my body is at by clothing fit rather than weight so this method resonates well with me. I put a picture on my fridge of an outfit I would like to wear to California (May/June). The idea is that every time I open the fridge I see myself in the outfit and make a healthy food choice. Prep cooking! I have been working on baking big batches of gluten free dairy free "treats" so when a craving strikes I have a better option available to me. Setting up my basement work out area. I want to organize all of my workout equipment so it's streamlined and easy to use. I'm mostly done, but need to figure out where to set up my Rip:60 and resistance bands... I also decorated with some inspirational posters, quotes, and pictures. 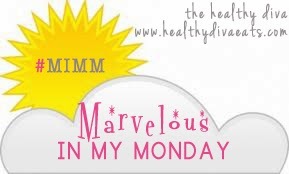 I hope you check out the Marvelous in my Monday link up and find some inspiration to light up the beginning of your week!